← More memories of St. Peter’s Church, East the Water. 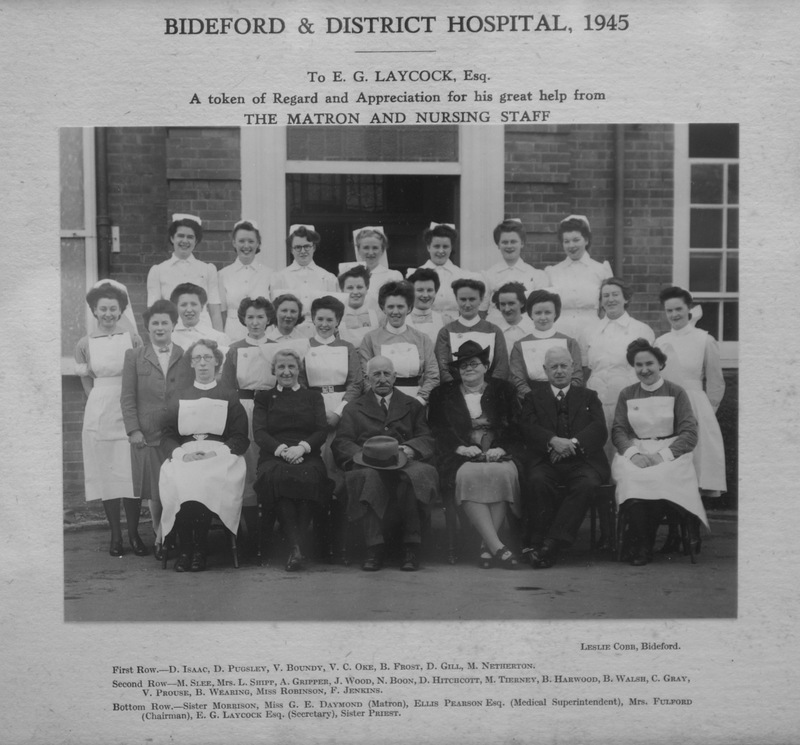 More memories of Bideford Hospital. There were three wards: male, female and children’s. Off the corridor leading to the female ward were three rooms for private patients. The staff, as far as I can remember, included the Matron, Miss Daymond. There was one Welsh SRN and two Irish SENs. The rest of us were students and we students were often left in charge of the ward. As a student nurse left in charge one night I forgot to hand in the key to the drugs cupboard. Luckily they found me downstairs in a lecture so I hadn’t left the building! On nights there would be one night nurse to each ward. The Night Sister did her rounds night and morning but was always on hand to give us help. She used to bring us our dinner – I don’t know if she cooked it herself or just warmed it up. She also used to make fudge using condensed milk. She later moved to Grenville Nursing Home in Meddon Street, as a midwife, and delivered our second son, Stephen. There was also an almoner, a kind of social worker who dealt with non-medical problems. There were no resident surgeons. Operations were performed by two GPs – Dr Hutchinson (?) and Dr Wake. The former had been an army doctor during the war. At first accommodation for staff was limited and I was ‘billeted’ at home, for which my mum was paid 7/6d. Later accommodation became available but I stayed at home – but of course the payments stopped. Rationing was still on and we were allocated our butter and margarine. The butter didn’t last long but I’d rather have eaten dry bread than the margarine so that was passed to my mother. People stayed in hospital much longer after operations in those days and there was a regular routine to prevent bedsores. This entailed washing and rubbing the vulnerable area with soap and water and then making sure it was completely dry with talc. Lectures were taken in a building below the main building and were taken during off duty periods. One of our chores was cleaning out the patients’ lockers. This wasn’t really a chore as it was a good time to chat to the patient. Training in those days meant two years in Bideford followed by two years in Bristol or Reading. In bigger hospitals the normal training time was three years. My pay was £4 a month, which I suppose was pocket money as our food and uniform were supplied. Then of course there was the sluice. All the bedpans etc were cleaned there (no throwaways). This task was usually allocated to the most junior of staff. 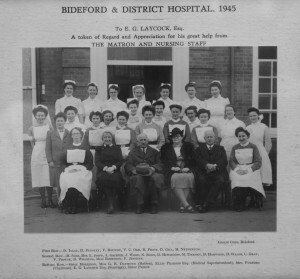 This entry was posted in History, Local People and tagged bideford, Bideford Hospital. Bookmark the permalink. 5 Responses to More memories of Bideford Hospital. I too was born in Grenville Nursing Home in 1948; on the 7th of July to be precise, just two days after the birth of the National Health Service. It would be nice to know how many deliveries there were there over the years. My son was also born there in 1969. Hi,i was wondering if there were any records going back to around the 1940s to the 1950s as I was born at Grenville Nursing Home in 1948 and my two brothers in 40 and 44.ive judt discovers after nearly 70 years where I was born and quite excited especially seeing a photo of the building.i now live in Austalia where ive lived for 43 years ,my two brothers have passed away,would love to get more imformation if possible or if you could put me on the right track.Our family of 6 were all separated at an early age.thanking you.Peter Joy..
Hi,i was wondering if there is a site that has past records as ive just found out I was born in grenville nursing home in 1948,i’m 69 now and quite excited about my discovery,our family were all separated at an early age ,I now live in Australia but my two other brothers have passed on,would love to find out more imformation,i know its a long shot…thanking you…Peter Joy. An excellent account of the hospital. I was a patient there on three occasions; well you know what small boys are like!. I think the surgeon was actually Dr Hewitson from same practice as Dr Wake, he saved my middle finger after a incident with a mangle in the backyard, though stiff from middle joint I am grateful for his skill as a surgeon. Although the NHS brought many badly needed changes I still have many fond memories of my stays there.